Cells differentiate and specialize within organisms by expressing different genes as they develop, so that one stem cell becomes part of a thigh muscle and another part of the thymus gland. But what makes organisms like bees specialize? Some are foragers and some are nurses, and most switch their specialties during their lifetime, sometimes a forager, sometimes a nurse. 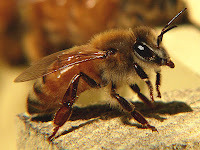 Queens are committed for life, and it has long been known that royal jelly makes a queen, but how does a bee become a nurse and then a forager? And why are these roles reversible? A paper published online in Nature Neuroscience September 16 by Herb et al., and reported on the BBC here, says that these behaviors are the result of epigenetic signaling. That is, it's not heritable DNA sequence differences that create castes, but chemical alterations to DNA within the bee's lifetime through the process of DNA methylation. DNA methylation affects gene expression rather than DNA sequence, but since it affects gene usage it is certainly valid to consider it 'genetic' in the functional sense of the world. But many people use the word 'genetic' to refer to heritable variation, passed from parent to offspring. One key thing that is being demonstrated in many ways is that the methylation patterns themselves can be inherited. Effects of genetic modification of this kind can affect traits--like disease susceptibility among many others--and be 'remembered' by the person who inherited a particular genomewide methylation pattern, and that pattern then transmitted to the offspring. A recent study in experimental flatworms is that this can happen for many generations. That, in a sense, is the deeper importance of DNA methylation. Whether or not that's happening with bees is another question. Herb et al. analyzed methylation patterns in tissue from the brains of honeybee queens and workers, but found no significant differential methylation rates (DMRs) between them. Most workers start life as nurses, caring for the queen and larvae for 2 to 3 weeks, at which time they transition to foraging. Comparison of DRMs between worker subcastes revealed 155 DRMs between nurses and age-matched foragers. These differences might have been due to the caste transition itself rather than the state of being a forager, but the authors tricked foraging honeybees into transitioning back into nursing the queen and larvae, and determined that the DMRs are linked to the phenotype, not the transition. They replicated their experiment to demonstrate consistency of results, and determined that reversion from nurse to forager reliably re-establishes methylation of many of the same genes, including one associated with learning and axon migration in fruit flies. They also found evidence of a high frequency of alternative splicing in DMRs, that is, changes in gene expression that come about by the same genes being transcribed differently, probably in response to methylation. This is all interesting in its own right, but as we often say here, it's further evidence that as we understand more about biology it becomes more complex, not less. DNA methylation assays are hot right now, but it has been clear for a long time that there aren't going to be genes 'for' most traits and behaviors, that something else, or numerous other things will be involved. Methylation may be a part of that repertoire, but like single genes, or single nucleotide polymorphisms, it won't explain everything.